Chakram is a round weapon, that can be thrown and has a cutting ability. Everyone knows this weapon is slightly more fantastic, than realistic, but it didn't stop chakram to become iconic and beloved. 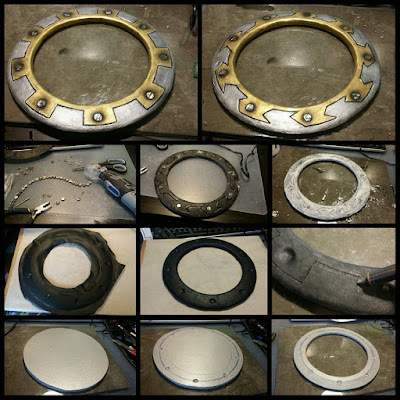 I've already written a lot about what to be careful of when starting to make chakram and I also shared my patterns with you in THIS ARTICLE. 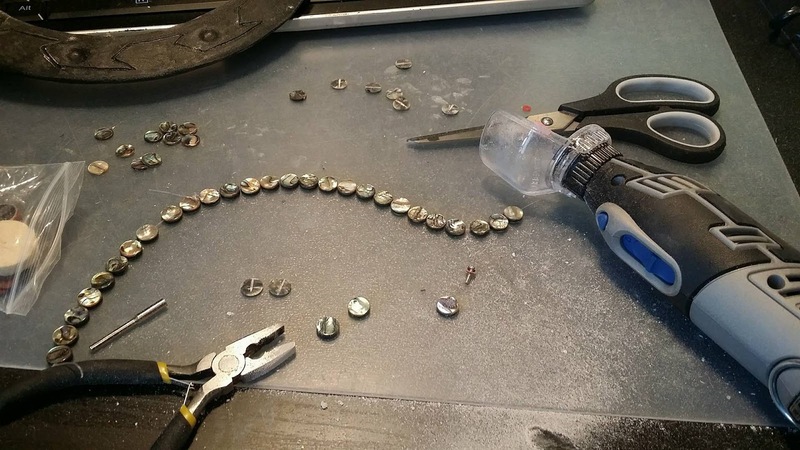 Following this article and assuming you have your patterns printed out and abalone shells prepared, let's go to the crafting section. I've bought pack of hardened polystyrene in sheets in about 0,5cm diameter. I've glued 2 sheets together with polystyrene glue, let it dry and trandfered my pattern onto it. Then I cut it with exacto knife and dremmeled into shape. I dremmeled the corners in the inner side round and I've used sanding sponge to make th outer edges sharp. I also slightly cut the parts, where abalone shells are placed. Then I covered the polystyrene chakram in black worbla. Be really careful with the heat, since too much heat destroys the polystyrene and it will melt it. If you are afraid to use polystyrene because of that, you can use harder EVA foam as core material. I took wood burning tool and burnt the pattern of chakram inside and I burnt also the places, where the abalone shells should fit. I cut the abalone shells in half to spare material and glue the halves inside the burnt places with hotglue. Then I smoothened the whole thing with latext cement, painted it with silver, gold, black and brown acrylics from Artemiss (insert the code GERMIA for 25 % off) and Pebeo. 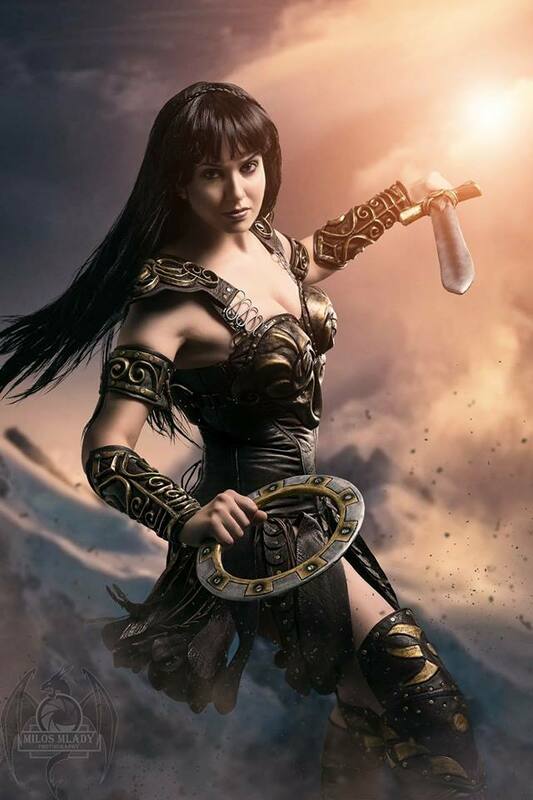 I gave up on my research, because I was lured to one particular design, that caught my eye in the process and I couldn't stop thinking about it even I know it is not exactly the most accurate version of her sword. I'm talking about this one - It has so many gorgeous decorations, that make the prop so much more interesting, that I decided I give this version a go. I started by making patterns. 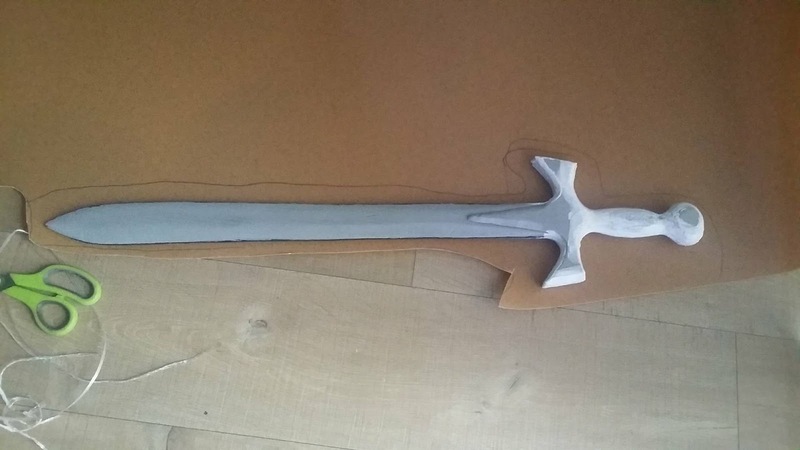 I found a pic of the sword taken perfectly from above, I trasnfered it into Gimp and adjusted his size to respond the actual size, I cut it into 20 cm logn pieces and extracted to Word and printed out. 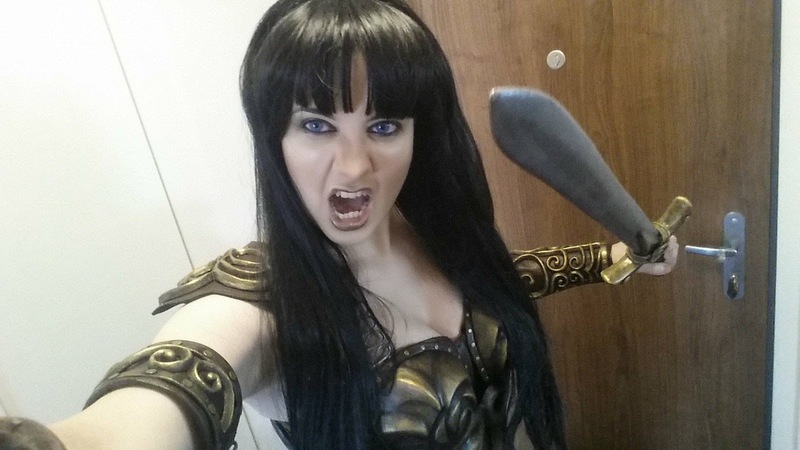 I've explained already how I measure size of props in my article about Pharah's wings - You have to have a full body pic of the character holding the prop, then enlarge the pic, so the centimeters respond to your height (18cm-180cm in real life) - measure the character to respond the height either of you or the actor/character if he was real. 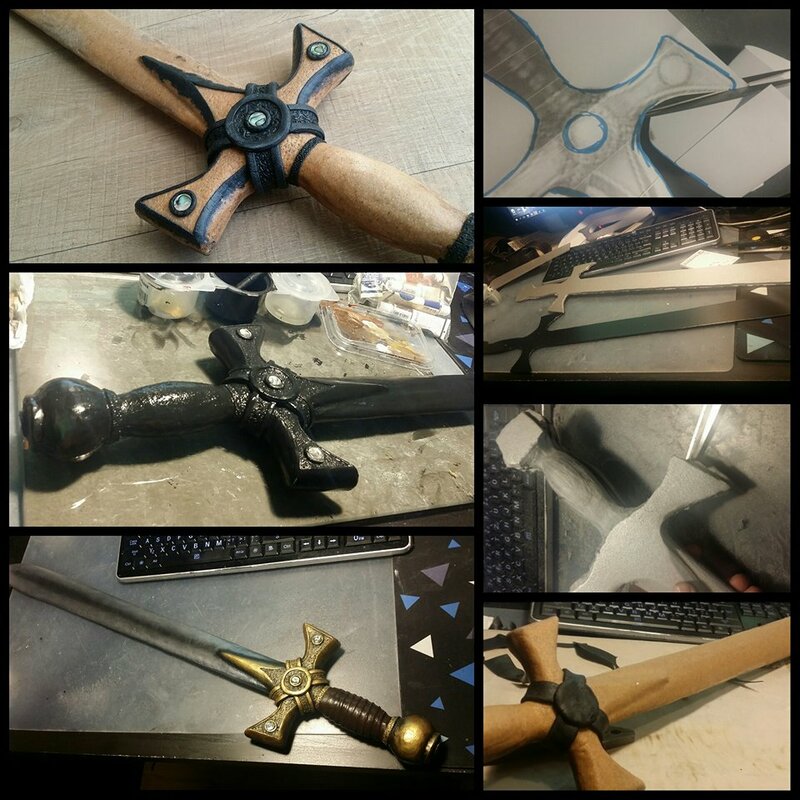 Then measure the prop you want to make (sword) and you have your measurements. I've found out the sword should be between 70-80 cm long, so it is a shorter sword. 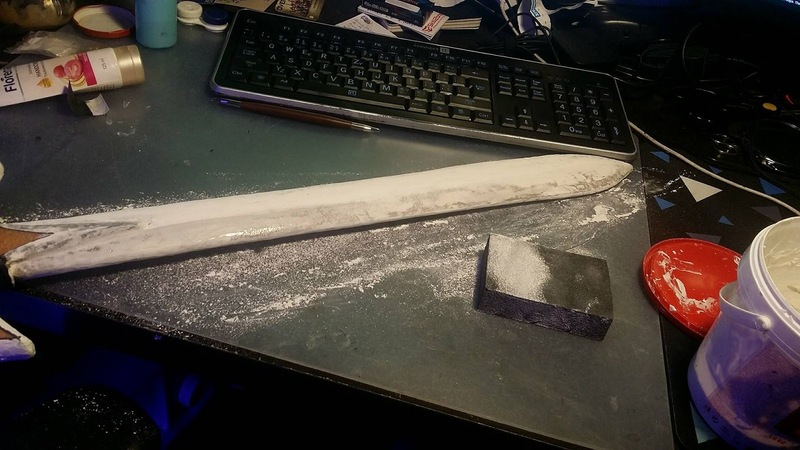 It is not as short as my Anna Valerious sword so it will definitelly need some kind of core material. 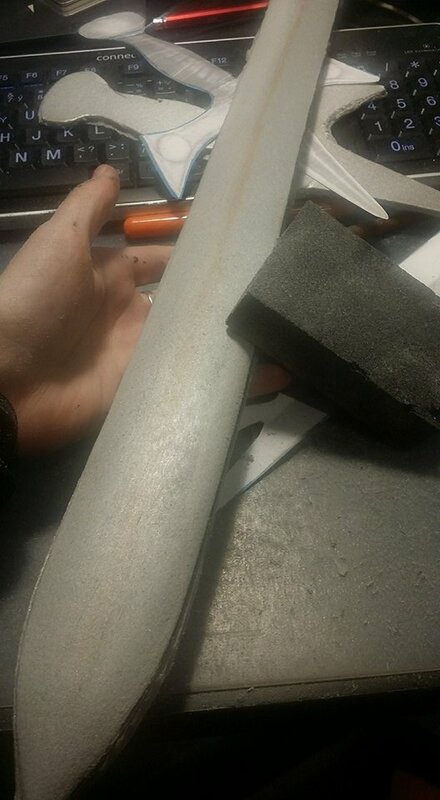 I bought a sheet of PVC and I cut the rough shape of the sword from it. I took two sheets from polystyrene and cut and glued them to PVC - 1 from each side - with hot glue - but be really careful with hot glue and polystyrene. 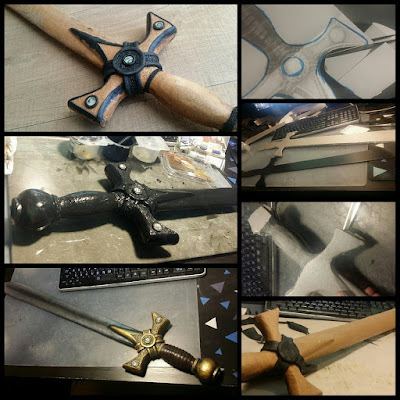 Then I added few layers on the hilt and sanded and sanded till my sword had edges, rounded parts and was prepared to be wrapped in worbla. 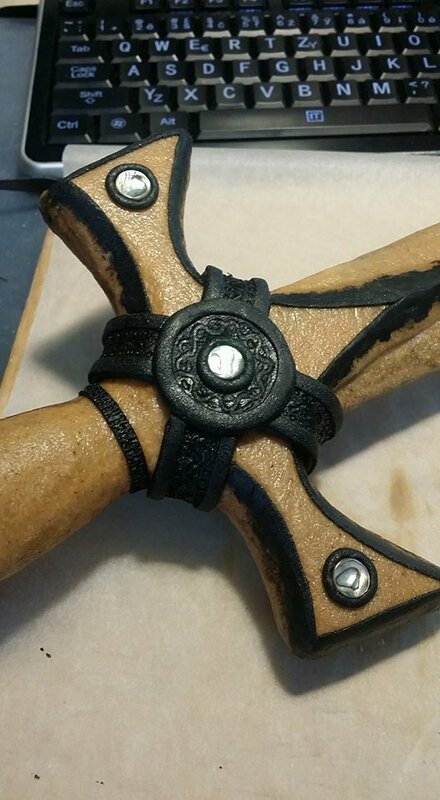 I wrapped it then in brown worbla like a sandwich and cut the rests of worbla on the borders. Then I took my wood burning iron and smoothened any surface I didn't like. Once again - be careful with hot gun an polystyrene - everything has to clap on first heating or else you will burn the polystyrene inside and cause surface problems. I did it too and next time I will definitelly use EVA foam for this build instead of polystyrene. I corrected my mistakes with worbla layers, wood burning iron and finally with sanding sponge, dremmel and latex cement. I took black worbla to make finer decorations and for bigger decorations, I wrapped moosgummi in worbla and sticked it onto the word, for finer decorations, I used only straps of black worbla. For the finest decorations, I took pointy tip of my wood burning tool and I made the engraving in the black worbla. I also added Abalone shell halves and glued them with hotglue on it's place. 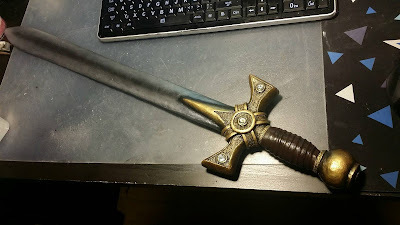 I smoothened the edge and some places on the hilt with two layers of latex cement and then I painted the whole thing black.I added golden Artemiss paint on the hilt and made highlights with Pebeo dark gold and I painted the edge with Artemiss and Pebeo silver and I've used airbrush. 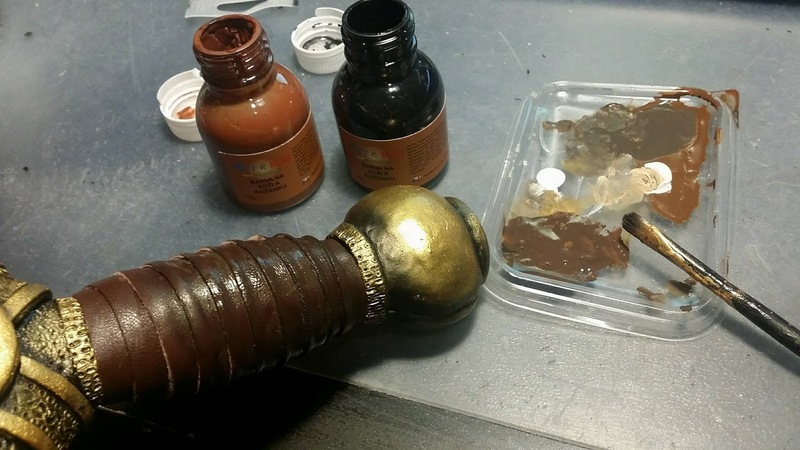 The last thing was the wrapping around the hilt, that I made from worn leather, which I later painted dark brown with Artemiss leather colors. I glued the wrapping to worbla with contact cement.